Have you ever asked yourself why we can smell seasons? How our childhood memories and seasonal habits influence and have conditioned the way we sense the world. In my childhood, my siblings and I had ice-cream and ate green salad only in summer, it was the only season for that. We still associate it with the hot weather. You eat your ice-cream quickly, otherwise it will melt. A little while after the summer harvest, the apple season comes, and then the grapes. And we loved autumn, it is the richest, most abundant season and fruit is ripe everywhere. You can almost smell the seasonal change. We grew up eating with the cycles of nature and it is important to consume food that was grown more or less at the time you are eating it. Eating seasonally promotes balance with both the earth's resources and its life forms. Moreover, off-season foods have to travel much further than seasonal fruit and vegetables to reach the local markets. This leads to higher amounts of wax coatings, preservatives and ripening agents in order to make them look fresh and healthy, or simply fake. The longer the food stays unconsumed, the more nutrients it will lose. It also messes with the culture and the traditions we tend to georeference to a place. In the moment you recognise the smell of chestnuts that crackles with the steam coming out under the lids of the street barrels that sellers bake them in, all your senses feel it’s winter. Sometimes this association may even overtake the actual arrival of the season itself with its meteorological characteristics. A funny thing: when my mother smells or sees oranges or bananas, she says that it feels like Christmas, because back in her Soviet childhood, the only time of the year such exotic products were imported was Christmas, or the end of the year, as Christmas was forbidden. Only in a handful of foreign luxury markets, called Corecom (in Bulgarian: Кореком) one could actually find the forbidden fruits, and had to be fast and queue for a long time in the cold. For many Soviet children, bananas symbolized Christmas. In the same way, I feel almost an anarchist when eating ice-cream in winter. Not to worry, we are now all together in the global market of constant utility and comfort, so you can eat whatever you wish all the time, under one condition - you can pay for it. On the contrary, the food markets still try to preserve our childhood memories and organic intuition for the seasonal. The perceptions coded in our past remind us that our nutrition is, above all, a cultural and conscious process. Something Western societies have long since forgotten. The food market is a place where sellers and buyers meet. Markets reflect a current state of the city. An Eastern wisdom says, to get to know the soul of a city, its cultural history, and local peculiarities, it is worth starting your visit with the markets, not the museums. The French have a long tradition and respect for their markets. 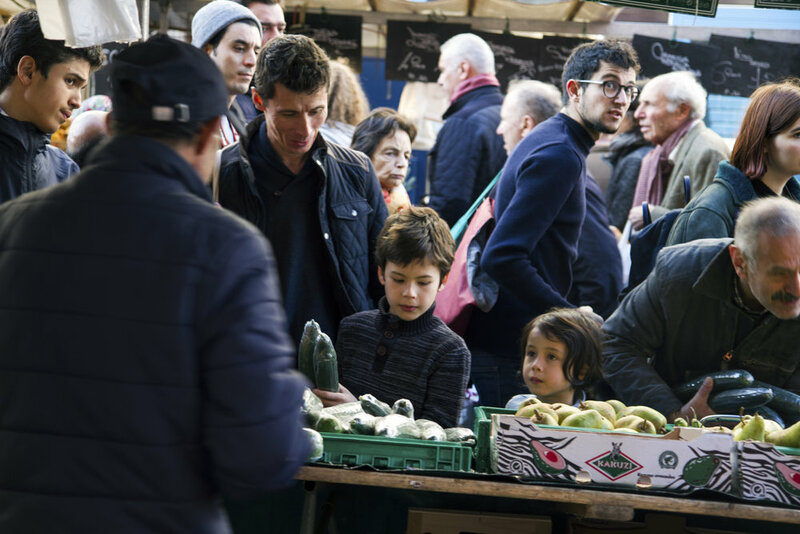 Today Paris has 82 food markets scattered all across the city. Emile Zola, another French guy, wrote a book inspired by the public market Les Halles (now a shopping mall, which locals do their best to avoid in their daily lives), in the late 19th century and called it “The Belly of Paris”. Markets are particularly lively on weekends, when most people don’t work and can go out to buy fresh food. To my mind they are more an analogy of open veins, where blood circulates through its streets and brings life to the urban. The market par excellence is Marché d’Aligre; from which I live a four minutes’ walk away. The Marché d’Aligre is found in three different places, each site having its very own atmosphere. The first location is the rue d’Aligre where all the stands are situated, and some permanent food shops and restaurants. 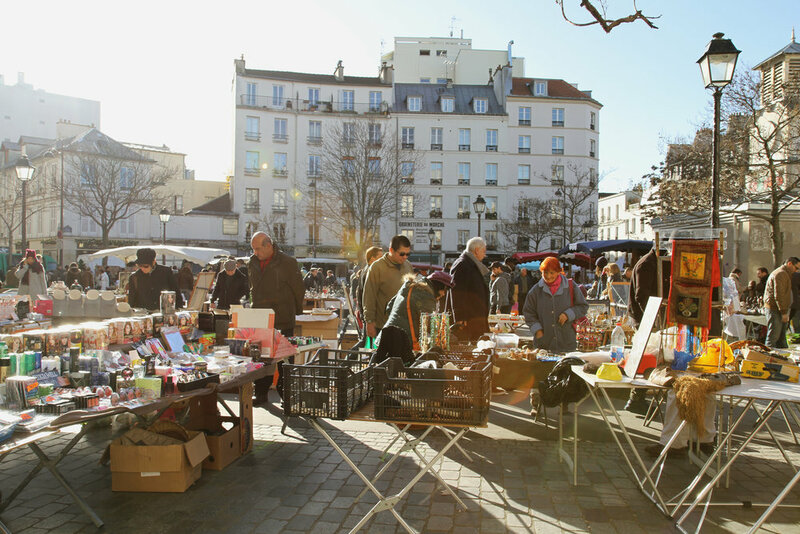 The second is the Place d’Aligre, where the flea market takes place, and where you can find all kind of bric-a-brac. The Halle Beauvau, the third and oldest part, is the covered market in the middle of the square. The 12th district of Paris is a good example of a place where the upper and lower classes meet. There is the traditional area with famous streets saved for the Parisian bourgeois, but you can also discern some new social housing squished between the old buildings. These are mainly apartments provided to low-income families and economic migrants. Besides the central station, Place d’Aligre is the only place in the neighbourhood where these two groups meet, and, apparently, enjoy it equally. This is the food market of Aligre, a municipality-owned colourful spot on the district’s map, situated between the Viaduc des Arts and the Faubourg Saint Antoine. There are many challenges that come with maintaining public markets in low-income or mixed communities. This one, however, still keeps an egalitarian atmosphere. Many migrants sell both organic and inorganic, or exotic food. A positive trend is that the number of farmers and local producers selling carbon-neutral and fair trade food is also growing. It is also a heaven for herb lovers, and rich with smells both good and bad. I am still struggling to get used to the smells of this city, but I try to focus on the nice ones - I love mint and at least ⅓ of the stands sell the herb. One can smell it everywhere. I am also addicted to the smell of freshly roasted coffee. When I was a little girl and mum came to take me from school in the cold cold Sofia winter, whist freezing at the bus stop in -15, she would take me to sneak in a nearby authentic coffee shop to stay warm. We would stand there and smell the freshly-roasted imported coffee beans in their big bags, which were stacked all over the place. So, many years later, I find myself doing the same in a Moroccan bio coffee shop at the market, where the vendor Salah knows most customers by name. In front of that coffee shop, many actors and buskers take their chances on weekends with an improvised show, or a short jam. During the last month, a local choir performed Christmas songs. Others take to the streets to promote social projects or campaigns. 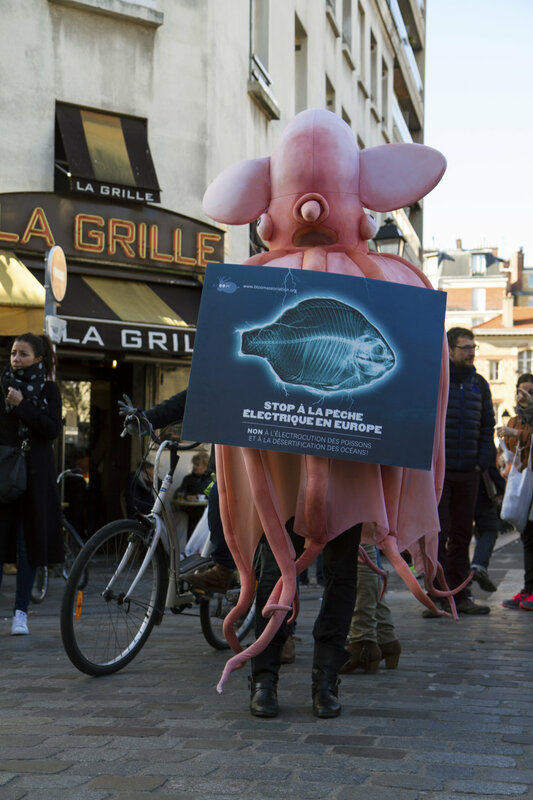 Just last week, I bumped into a huge pink octopus in the middle of the street, holding a poster with the written appeal: ‘’STOP ELECTRIC PULSE FISHING IN EUROPE’’, while in the meantime, a little girl was pulling his tentacle. He posed for my camera. A woman, next to the octopus, entirely immersed in the mission, was providing detailed information on their campaign. 5. Singing, bargaining, mocking, playing, meeting others. The market as a verb! Vendors tend to advertise their wares at the top of their lungs to passing shoppers. They praise ‘the finest plums money can buy’ at the top of their voices, ‘2 boxes for 2 euros!’ from open stalls. This is the most exotic moment of the whole market day adventure. Even if you don't have a special talent to haggle over the price of onions, sweet potato, or avocados - you just have to give it a go. These are your 5 minutes of negotiating glory, where no previous skill or experience is required. Yet it’s a ritual that takes me back again to early childhood: holding tightly my grandfather’s hand, I would journey into the magical world of the food market. While walking, he would tell a story to every person we bumped into. And I was like a sponge for all these stories, whether they had actually happened or not. His best receptor. For my grandfather the market was a metaphor for the abundance, for something cheerful that keeps the spirits up. A man who was raised and grew up during the war. Who had a childhood with no sugar, no meat, but food coupons based on weekly quotas. He loved sweets, and fruit, and I was his little accomplice in the daily crime to spend the morning hanging around and making unusual friends. The kind of support he definitely couldn’t find in my grandmother. So, we would spend at least 20 minutes at each stand, cracking jokes and exchanging life wisdom and general knowledge with vendors, and haggle whenever the chance arose to do so. My grandparents’ house is only 3 minutes away from the market, but somehow, our mission always took us a few hours on average. This is culture. "Are you important? Could you take our photo?" And while in Paris it seems public markets have been well-preserved and their economic and social value widely recognised, in Eastern Europe, many public markets have closed to make way for new shopping malls, and large, mainly foreign-owned, supermarket chains. Due to the lack of political will at the time, and private pressure, many people lost their small businesses. This doesn’t appear to be the case in most of Western Europe. Keeping old places alive, and in active use, is relevant to the needs of communities today and must be the first duty of local governments. It is also essential to connect a city with its past, keeping historic neighbourhoods attractive to sustainable tourism, and helping to maintain quality of life. Even if you don’t immediately recognise it, public markets are enriching our lives. It is an anthropology lesson in action. The noise, the sounds, the accents, the colours, the smells and the numerous languages one can hear in such a compressed amount of time make this whole vibrant experience a tiny local celebration of life, and immediately code it into the collective memory. In the Aligre’s quartier all streets lead to the half-moon shaped square, a feature inherent to the remote Roman planning tradition. There in the middle of rue d’Aligre I am standing still, peeling the tangerine that was given to me for free by a fruit seller when he failed to correctly guess where I come from.